First constructed in 1555, Spanish conquistador Francisco Pizarro laid the first stone of the church on the day Lima was founded. One of the church's fifteen chapels memorializes Pizarro and his remains are said to be held in the crypt. The Cathedral is stunning throughout. The interior is adorned with cruciform pillars, candelabras and Italian marble flooring. Its Museum of Religious Art houses artifacts, paintings, and other artwork from the 17th and 18th centuries. 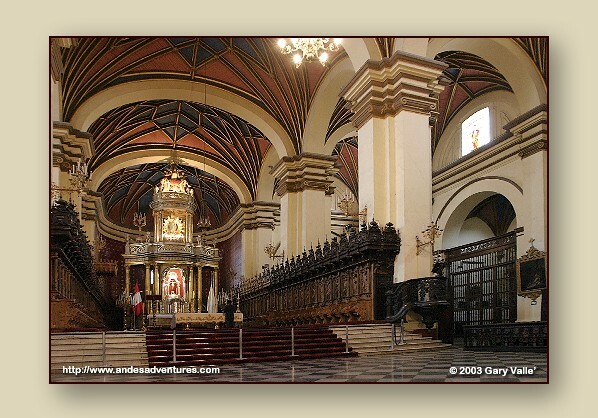 The Cathedral has been rebuilt several times, and was nearly destroyed by the estimated 8.2 magnitude earthquake of 1746.